Oct. 23, 2017 10:00 p.m.
Jason Kenney was feeling confident when made his final round through Central Alberta to help gain support for his bid to be the first leader of the United Conservative Party (UCP). “We feel we have a strong base of support from the legacy Progressive Conservatives and growing support from people in the Wildrose Party,” he said after an open house speech at the Harvest Centre in Red Deer. 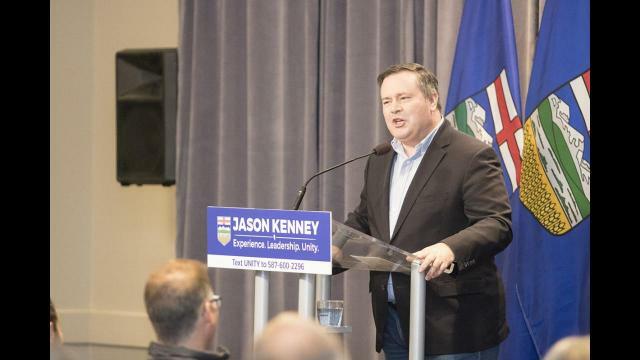 Kenney spent much of his speech focusing on the policies of Canadian Prime Minister Justin Trudeau and Alberta Premier Rachel Notley, rather than focus on his leadership opponents – Brian Jean and Doug Schweitzer. One of his opponents was also in Red Deer earlier that day, throwing his support to the life-saving cardiac catheterizing service that is missing from the Red Deer Regional Hospital and which is currently being lobbied for by local doctors, politicians and residents. Kenney wouldn’t directly commit to funding the service if he were elected premier, but was open to the idea. Kenney said that he would focus on providing better value for health care dollars invested. Kenney said the shift towards questioning the federal government is representative of what he has seen from Albertans. He added federal policy has led to western alienation and even support for separation. “It is more than I can recall in my adult life. I am a Canadian patriot and I want to channel that frustration into positive political direction rather than divisiveness,” he said. UCP members have the opportunity starting Thursday and ending Saturday to vote for Kenney, Jean or Schweitzer.